1. 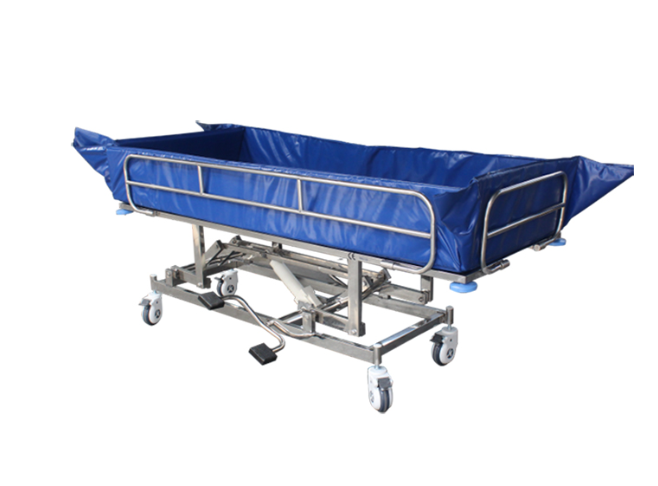 Hydraulic height regulation by foot lever 2.Bed frame: sennior stainless steel, mirror finish 3.Bath: made of kayak mateirial with high tenacity, REACH, ROSH, EN71 approved, inside material high density EVA, soft, heat resistent(+80°, -10°), deforming and aging resistent, easy to be disassembled for sterilization 4.Size: 1950*740*500~900mm(±5%) 5.Load bearing: ≤130kg 6.Guard rail: height 270mm, easy to transferring paitient into bath 7.Dewatering: the whole bed tilt 1°, that is bed head is 3cm higher than bed foot, designed for dewatering; guardrail is 13° outward-inclined 8.Casters: covered, with independent brakes, easy to move, simple to operate, reliable performance. frame parts are made of stainless steel.